Our beautiful Planet Earth is a conscious and vibrant living entity. As our body have 7 major Chakras, so does the Earth. Energy flows through each of Earth's main Chakra and makes up the spiritual body that is our world. The Chakras of the Earth are connected by energy circuits called Ley lines. This planetary grid system has been known and mapped for Millennium. Ancient civilizations revered Earth as a sacred entity. They believed her to be their “Great Mother” and often built their megalithic sacred monuments in areas they considered “Earth’s Highest Energy Vortexes” or “Earth Chakras”. Structures like Stonehenge, the Pyramids of Egypt and Mayan, Aztec, and Incan monuments along with many temples, churches and pilgrimage sites are now considered powerful energetic spots. Visiting these sites, especially to mediate and make ceremony, can result in strong connections with mother Earth, opening your own Chakra centers, and the ability to be a stronger conduit of universal energy. It’s remarkable how our own system is a smaller version of the Earth: 70% of the Earth is covered by water and the human body is approximately 70% water… the body is made up of trillions of cells and the Earth contains trillions of life forms… when one ecosystem suffers, the whole Earth suffers and when one organ in the body suffers, the whole body suffers. This is why caring for our Earth’s chakras is as important as caring for our own. A continuous interaction is believed to take place among the Earth’s major and minor Chakras through an “Earth Energy Field”. It is described as a matrix of connective pathways resembling the human circulatory, nervous, or acupuncture meridian systems. Their intersection culminates creating high energy vortexes. Some are deemed positive in nature and others negative. The Himalayas and the Peruvian Inca territories are considered Positive Vortices. On the other hand, the Bermuda Triangle and the Devil's Sea, east of Japan, were identified as “Vile Vortexes” or “Electromagnetic Disturbances” by American biologist Ivan P. Sanderson. He discovered twelve Negative Energy Spots, caused by hot and cold currents, symmetrically distributed at equidistant locations from the equator. Mapping those locations revealed an energetic network connecting them. 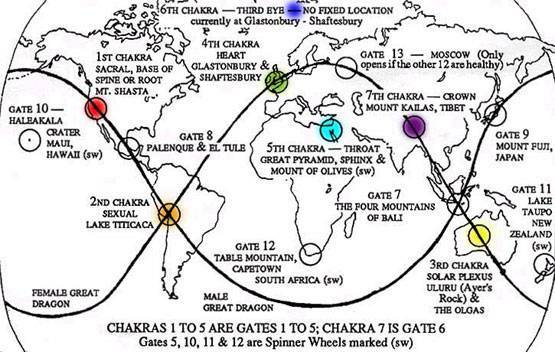 There is one Earth Chakra located on each continent, with the exception of Antarctica. At the center of each chakra there is a major sacred site. From this sacred center, the chakra expands in a circular fashion – its radius extending for hundreds of miles. If an earth chakra was operating in a state of optimum health, the approximate radius would, in most cases, be approximately 777 miles. It must be remembered that this is only an average figure, as all chakras are living organs which expand and contract, according to the complexity of conditions which may affect them. The ancients were well aware of the properties of these places on the Earths surface. While these locations are known as the major energy vortexes of Earths energetic body, there are thousands of other places where the energy is strong, promoting the ancients to build structures on these sites. The study of Earth Chakras is similar to acupuncture, since we are exploring the more subtle energy structures of the Earth. The sacred site at the centre of a chakra largely defines the purpose of the world organ. Myths, legends and archetypal symbolisms traditional to the site illuminate the function of each earth chakra. Also, the regional human culture in each area takes on some of the “ flavor ” of the earth chakra located in its vicinity. Each chakra is a dynamic vortex of subtle energies. In some situations, these forces may spin and spiral in either clockwise or anti-clockwise directions. In other circumstances, the power of an earth chakra may be directed in a straight line along what are termed dragon paths, ley lines, or song lines. These connective pathways are analogous to the human circulatory, nervous, or acupuncture meridian systems. The great ley arteries of the Earth connect one continental earth chakra to another. The Earth can not be understood in isolation from the rest of the solar system. In particular, the rhythms of the moon and sun are vital. Also, the various movements of the Earth itself are important. All of these terrestrial, lunar, and solar movements have a profound effect upon the earth chakras. For this reason it is essential to always ask this question: When are the most auspicious times to interact with the various earth chakras? Each chakra has its own place in time. In addition to the solar system, the earth chakras are also open to the forces of the four elements – fire, air, water, and earth. For this reason, all earth chakras have their major horizontal dimensions conjunct the Earth’s surface, where they are in direct contact with sun, air, and water. There are no subterranean or submarine earth chakras. The world has a heart chakra. It also has will, vitality, and communicative centres. Each individual chakra has its own unique contribution to make to the health and destiny of the world. It is important to remember – as we locate and define the functions of the earth chakras – that their continual interaction among themselves is the key to a greater quality of life on the planet. No earth chakra acts in isolation to the others. The earth energy chakra system allows us to experience a sense of oneness with other beings living on earth. The earth ego and survival energy category (plant kingdom, animal kingdom, water mass and life in it). The earth heart and soul energy category (element of earth, element of air, element of fire, and element of water). The earth advancement and intelligence energy category (weather, communication, and balance of life). Just sit back enjoy the music and scenery as you ask for healing energy for yourself and other beings living on earth from the bottom of your heart. Just have fun doing it. Share it with friends.